As throngs of Rick and Morty fans hunted down limited supplies of Szechuan Sauce at McDonald's last weekend, their outrage over the chain's inadequate supply could be heard all over Twitter. On Sunday morning, a man named Alex Arbuckle woke up to the commotion, and decided to deal a crushing blow to the frothing Szechuan-heads, and boy did it work. Arbuckle, a photo curator at Mashable, posed as Rick and Morty's creator on Twitter and lamented the poor behavior of his acolytes, many of whom sunk to the lowest depths of cartoon fan depravity when the sauce supplies ran out. Apparently, many Rick and Morty fans believed the prank, in which Arbuckle said he had to "delete" the show in response to his fan's unbecoming actions at Mickey D's locations across the country. In light of recent events, I’ve made the decision to delete Rick & Morty. Thanks and love to all the fans for three incredible seasons. I am downloading all extant copies of the show, which I poured my heart and soul into, onto a Blu-Ray and throwing it into the river. I understand this decision will be disappointing to many, but I believe it’s the right one. Thank you to everyone who worked on the show. And a very special thanks to the man who coined Rick’s catchphrase “wubba lubba dub dub,” guest writer and close friend Orenthal J. Simpson. 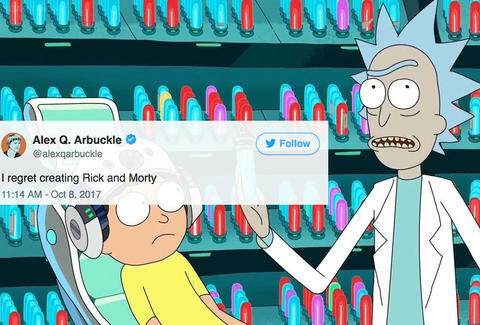 Arbuckle's joke was obvious, but the hoax was given a semi credible look when he changed his Twitter name to "Rick and Morty Creator" (it's since been changed back to normal). But despite the glaring fact that Arbuckle's tweets wreaked of falsehood -- Rick and Morty was created by Justin Roiland and Dan Harmon, the latter of whom is a co-creator of NBC's Community -- more gullible Rick and Morty fans bought into it like a winning lottery ticket. "The fans were not pleased," Arbuckle said in a story for Mashable. "As my phone began to sputter and overheat from thousands of new follower notifications, fans flooded my mentions and inbox with love for the show and horror at its imminent destruction by river." This is made all the funnier by Rick and Morty fans' self-perpetuated reputation for being very smart people. Because the show traffics in lots of esoteric and sci-fi heavy themes, the program's aficionados tend to think of themselves as great, big, internet-savvy brains. To give you an idea why, the show's real Twitter account earlier this month had a conversation with Elon Musk about the singularity, the concept of robot AI surpassing regular human intelligence. Still, that didn't stop Arbuckle's troll from stretching over 24 hours. I brought R&M to the river and a gull took it. It’s the gull’s show now. I’m done. Thanks to everyone, especially exec producer Jeff Dahmer. The shameless duping of Rick and Morty diehards aside, it isn't going to stop the limited edition Szechuan Sauce from rearing its gooey head once more, as McDonald's confirmed earlier this week that it's going to return to restaurants sometime in the near future. Whether another brave troll will be able to trick Rick and Morty fans again, though, is another question that remains to be seen.